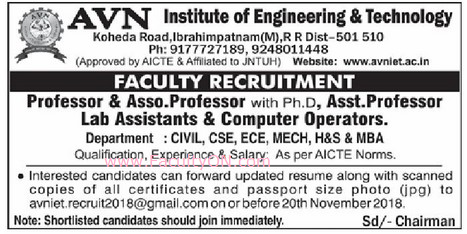 AVN Institute of Engineering and Technology, Hyderabad has advertised for recruitment of Teaching Faculty- Professor / Associate Professor / Assistant Professor Plus Non-Faculty jobs vacancies. Interested and eligible job aspirants are requested to apply on or before 20th November 2018. Check out further more details below. About College: AVNIET, a premier institution offering engineering education in the streams of CSE,ECE,EEE,CIVIL and Mechanical. AVNIET comes from the stable of Dilsukhnagar Public School having 27 years of academic excellence, under the leadership of chairman Mr.AVN Reddy. Established in 2009, affiliated to Jawaharlal Nehru Technological University (JNTU), Hyderabad, and is approved by the All India Council for Technical Education (AICTE), New Delhi. How to Apply: Interested and eligible candidates are requested to send CV, scanned copies of certificates, copy of PAN card, copy of Aadhaar card, and recent passport size photos to the eamil address given below.